The system can be configured with one or two oil/air outputs which can be used for either external spray nozzles or through the spindle lubrication. The output volume of the Uni-Max Revolution™ can be tailored to each tool in a machine directly from the CNC program, allowing for optimization of each machining process. Uni-Max Revolution™ Saves You Money! The Uni-Max Revolution™ not only improves the efficiency of your CNC machines, but also your bottom line. Unist systems routinely eliminate the need for flood coolant while also significantly increasing tool life and feed rates. Fluid disposal costs are now a thing of the past, and overall production costs can be reduced by up to 15%. Since the lubricant application is so minimal, your chips will be dry and ready to recycle without any further processing. Now that is revolutionary! Designed to be programmed from M-codes, the Uni-Max Revolution™ allows the operator to precisely control the amount of fluid being dispensed for each job. Featuring two independently controlled fluid applicators and an air blow-off nozzle for chip removal, the Uni-Max Revolution™ allows you to dispense the lubricant exactly where needed, in the amount needed – down to 0.20 ounces (6mL) per hour. Whether it’s being applied through the cutting tool or an external nozzle, the Uni-Max Revolution™ is the ultra-precise lubrication system that will take your CNC machine to new levels of performance. The Revolution™ can be installed on a machining center to dispense MQL lubricant to the cutting tools in the most effective way possible. 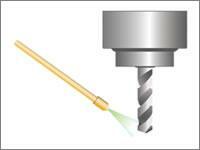 Depending on the machine, this can be done externally through a spray nozzle, internally through tools with oil holes, or a combination of both.